Fill out the application - be very specific with all of the questions and don't be afraid to go in depth. I ONLY accept clients who are ready to invest in themselves on the call and get results quickly. What inspired you to decide to fill out this form right now? What attracts you to working 1x1 with Elaine? Do you believe you have the ability to change your current circumstances? Why or why not? What feelings, thoughts + emotions surround you at this time? What other programs/things have you invested in to work on yourself? Do you have or are you willing to find the means to invest in yourself? On a scale of 1 to 10, how motivated are you to do the work to transform yourself? 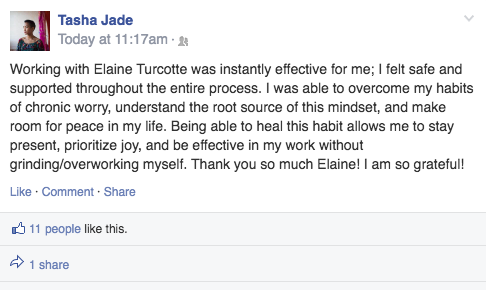 I just experienced the magic of Elaine Turcotte as she coached me through changing a long-held belief. This one belief has been getting in the way of my full happiness/success for most of my life. Elaine guided a gentle visualization that allowed me to very clearly ‘see and experience’ the belief. She then, somehow, unraveled it. Like I said, magic.